Being in the belly of a beautiful beast affords an abundant opportunity for adventure. 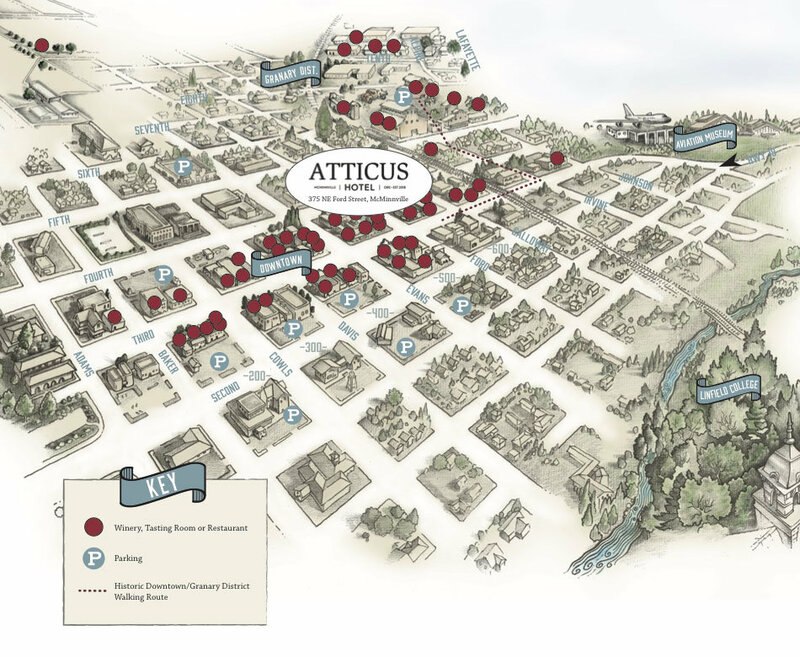 The Atticus Hotel is within striking distance of some of Oregon’s most alluring spots, making it your haute home base for exploring the state’s many wonders. Head west to Pacific City, a quaint beach town with a coastline so breathtaking it seems like a painting. Walk behind a waterfall at Silver Falls State Park, home of the arresting Trail of Ten Falls situated in the foothills of the Cascades just outside of Salem. A bit deeper into the backcountry is Opal Creek Ancient Forest Center, an uber Oregon setting of thick rainforest, towering peaks and trails along a piercing blue waterway. Head north and east along the mighty Columbia River into the Gorge, a spectacular mix of rugged topography, untouched forests and daring windsurfers. Take in the tallest waterfall in the state in Multnomah Falls en route to Hood River, Oregon’s gorgeously set gateway to Mt. Hood. For the urban minded, Portland is just up the Willamette Valley and offers an unmatched concentration of fine food, beer, music and crafty shops. 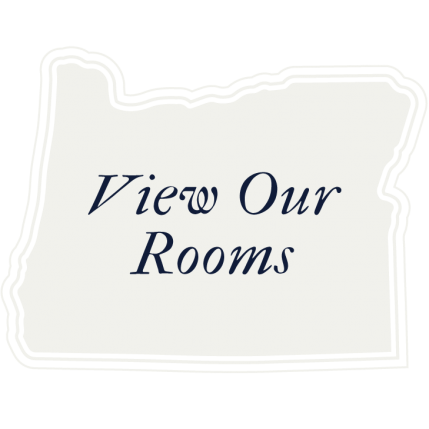 Some of Oregon’s best views are right in our backyard. 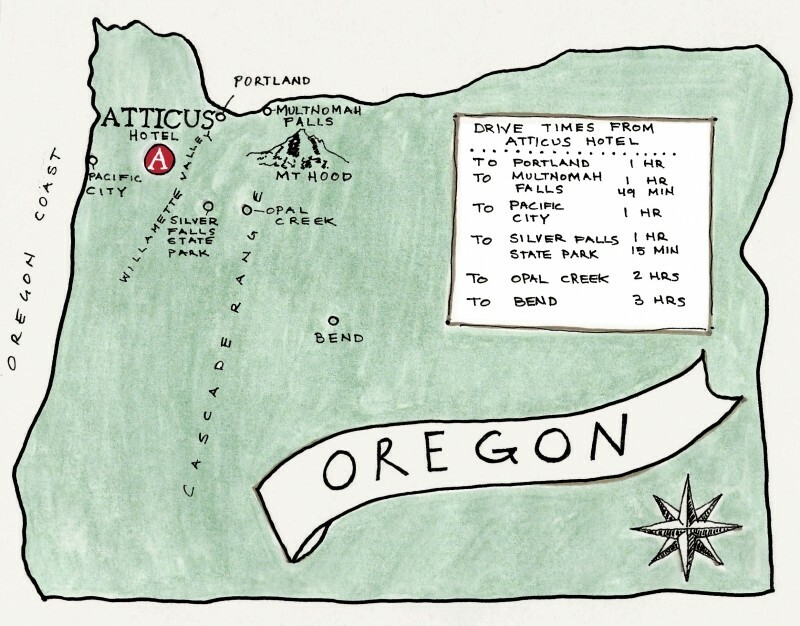 Being in the heart of the Willamette Valley, the Atticus Hotel is home to rolling vistas, sweeping vineyards and mountain-studded horizons. Our concierge can’t wait to deliver you to some favorite scenic spots.